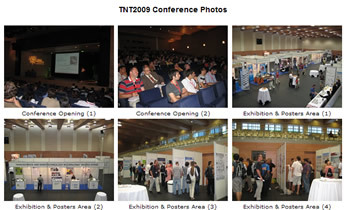 TNT2009 is been launched following the overwhelming success of earlier Nanotechnology Conferences. The TNT2009 edition (September 07-11, 2009) will take place in Barcelona (Spain) in particular to emphasise the importance at the Spanish and European level of the Nanoscience and Nanotechnology activity of the Catalonian region. This high-level scientific meeting series aims to present a broad range of current research in Nanoscience and Nanotechnology as well as related policies (European Commission, etc.) or other kind of initiatives (nanoGUNE, FinNano, GDR-I, etc.). TNT events have demonstrated that they are particularly effective in transmitting information and establishing contacts among workers in this field. The TNT2009 structure will keep the fundamental features of the previous editions, providing a unique opportunity for broad interaction. TNT conferences provide an ideal venue for industrial, academic and governmental organizations to share common objectives and drive the commercialisation of nanotechnology discoveries. This year we have chosen Barcelona for TNT2009. This lively city is located on the Spanish Mediterranean coast, and is well connected by road and rail to other parts of Spain and Europe. In addition, Barcelona International Airport is the second largest in Spain. Research Institutes and Universities, technology and research centres (ICN - CIN2 - IN2UB) and extensive business and industrial activities, all combine to give Barcelona, and its surroundings, its singular potential for commercial growth and development. TNT2009 also wants to encourage local entrepreneurial companies, universities and technological research centers to join the conference, and to participate in the exhibition. For this purpose, the organisation will set-up a macro exhibition area with standardized exhibition stands for Technological Research Centers, Universities, Spin-Offs and N&N initiatives from Cataluña area.